One of the greatest masters of the Dutch school is Jan Steen (1626-1679), with Hals and Ruisdael, is one of the trio who fill the second step below Rembrandt's supremacy, as a goodly company crowds the step below them. Jan Steen does not give us the silks and satins of those who occupy the seats of the mighty, as Terborch or Netscher did; just the plain people he limns. But this roguish Rabelais of the brush breathes in all his work such waggish wit, such droll satire, such whimsical, good-natured humour, that he is irresistible in attracting us to him by bonds of human, sympathy. 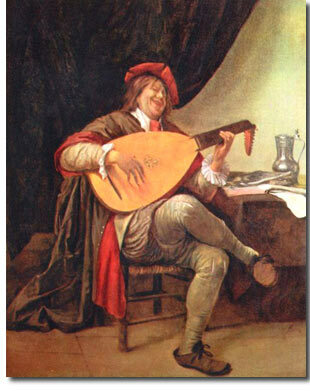 The many tales told in which he is made out as a debauched profligate and "ne'er do weel," a typical drunkard such as his brush so often depicts, one who spent his life in the pursuit of pleasures of the lowest kind, taking no thought far the morrow and painting only when debts had to be paid. A man who, in a comparatively brief career, could paint nearly five hundred pictures, while the last he painted bear no evidence of the trembling hand of intemperance but are of the best he produced, cannot have been what his denouncers would have us think. Even his financial troubles were most caused by an unfortunate business venture and by his assuming the debts of his father-in-law, Jan van Goyen - another proof of his kind-heartedness. He was a genial, jovial fellow, light-hearted and fond of a jolly crowd - which no one will regret who looks at his portrayal of the human comedy. If sometimes he is a little coarse and vulgar in his chronicles of guilty folly, such was the character of his period and his surroundings, and we offset it by his rendering of the sweetest childhood ever painted. If nothing else, he would be the chronicler of child-life. Van Ostade drew infancy and child­hood, ill-shaped, button-nosed, stumpy and square, already worn by sad experience; de Hooch painted them as little house-keepers, old in their ways, taking life seriously. Jan Steen's children are joyful, radiant, arch and merry - young and luscious and sweet. He must have had and kept, under all his rollicking boisterousness, a clean, young heart that loved the pure innocence of children's joys. The few facts concerning his life are soon told. He was the son of a well-to-do brewer of Leyden, who first sent him for a year to the University, but seeing his mistake, let Jan have his bent in various studios. He was with a German, named Knupfer, then in Haarlem with Adriaen van Ostade, also watching Frans Hals, and last with Jan van Goyen in The Hague, whose daughter he married soon after. His father, hard-headed business man, did not take much stock in the idea of the ability of an artist to support himself by his brush alone, so he settled the newly married couple in a brewery in Delft, the same business in which he himself had prospered. But his son devoted more time to his easel than to the brewery, except to utilize the mise-en-scene of the adjunct tavern for the setting of his pictures. The business went to naught and Jan Steen, loaded with debts, to which those of his father-in-law were added, had to call on his own father for assistance. Far a period of eight years he resided then in Haarlem, where his best pictures were painted. But his circumstances remained straitened by sickness in his family, while his paintings sold for as small an amount as twenty guilders a piece, rarely far as much as fifty guilders, far his townsmen never took the jolly painter or his work seriously. In 1669 his wife died and was buried in Haarlem. The same year his father died, and our painter returned with his children to Leyden, where he settled in the house wherein he was born. He soon obtained permission to open therein a tavern, over which, he established his second wife, a widow of easy financial circumstances. In this tavern, which he frequently painted, we see him making merry with his boon companions, feasting and revelling, but at the same time industriously working at his art, with unfailing powers, to the very end. Jan Steen was not a buffoon; on the contrary he was perhaps the most intellectual of all the Dutch artists. His mentality was sympathetic, philosophic, and beneficent-satirical. There is never a sardonic, malicious sneer an his lips, but in the picturing of his wildest orgies he always points a moral, plain enough that he who runs may read. In fact, I ascribe the apparent carelessness which we sometimes detect in his work to his being carried, away by his ideas to the detriment of his execution. While others used their ideas for the love of painting, he used painting merely as an expression of the boundless wealth of his unfettered, dramatic imagination, and sometimes his painting had to suffer. He was a fine draughtsman, giving movement to his figures, whereby they form living scenes from the drama of humanity. He was an excellent colourist. Sometimes his colour is brilliant, again it is deep, strong and juicy, while his treatment of light and shade makes him a true member of the great school to which he belonged. In his best pictures we find a combination of qualities that no other master has ever approached.